A political Supreme Court? Or a Court with weak integrity? Philippine Supreme Court justices and many judiciary employees often raise the cry of “judicial independence!” It is a demand to be left alone from interference by the Executive and Legislative branches of government. 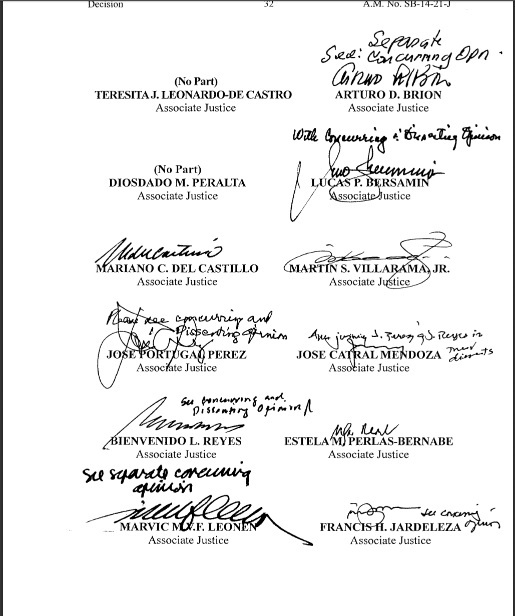 Backers of impeached Chief Justice Corona claimed that charges against him were an attack on the independence of the Court. My argument at the time was, no, Mr. Corona undermined the independence of the Court by accepting an unethical or perhaps illegal midnight appointment from President Gloria Arroyo. The “independence!” cry was again raised by judiciary employees when the Aquino Administration filed its Motion for Reconsideration of the recent DAP ruling by the Supreme Court. Well, checks and balances are not an attack on independence. They preserve a careful balance among those with great power. Budgeted funds under President Arroyo were planned for corrupt or wasteful projects. Returning the money to Treasury would cause the economy to lag. Re-investing the money to better uses would energize the economy; there was precedence in that prior Executive administrations did similar things. So – in good faith and with good results – President Aquino approved the program and Secretary Abad followed through to the nation’s benefit. The Court in its ruling determined that this was illegal, and intentionally so. And concluded that its execution was a crime. The Court could not find any relevant language in the Constitution that empowered Executive, in an unusual time and circumstance, to take good care of the nation and its citizens. They could not find a bed of authority that would recognize good faith, good intent, and good results as important. Rather, what was important to the Court were legal specifics from which emerged a ruling that undermined Executive powers from here to eternity. Article I, Section 4. The prime duty of the Government is to serve and protect the people. . . .
Why did the Court rule harshly on DAP? To help the country? No, killing DAP did not help the country. It hurt some settlers living on dangerous river banks, and it burdened future changes in the budget with administrative delays. It made the nation less efficient. To establish clear case law that Executive has very narrow and limited discretionary authority in the area of spending budgeted money? Well, that point could have been made without declaring acts that helped the nation as criminal. To establish the Supreme Court as powerful and independent? That is, for political reasons? The institutional safeguards are wanting. The effort to cleanse judicial ranks of “hoodlums in robes” has not become institutional but remains heavily personal. The flaws unmasked by the whistle-blowers merely confirm what the JBC, the President and the Court have known all along. And, until last month, they all looked the other way. We extol “judicial independence” and insulate the courts from all forms of politics. But we ignore the politics within the courts. We create a judicial cocoon that hides their own internal politicking that, unbeknownst to us, may have cost lives due to the defective Kevlar helmets that Napoles sold to our generals, for which she goes scot-free, and for which by God’s grace ex-Justice Gregory Ong has only belatedly been exposed and punished. It’s said justice is too important to be left to the lawyers. Reality is even worse. Justice is too important to be left to the justices themselves. The Inquirer could not have been more clear or more harsh. The judiciary is infested with politics. Following are links to the case opinions found on the Supreme Court’s web site. If you like the law, the opinions make for interesting reading. And if you are a film writer, you have the outline for a fine television drama right there on those pages. The dialogue is even scripted for you. The main points of dissent on the degree of punishment were: (1) that no one actually saw cash going from Napoles to Ong, and that the testimony of witnesses, although convincing, was hearsay, and (2) Ong’s dishonesty was a fairly minor incident. 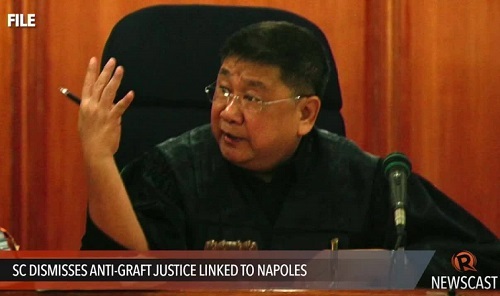 Bienvenido L. Reyes: Considered testimony (Luy saying Ong received cash from Napoles) as hearsay with the only proven fact being that Ong erred by associating with Napoles during trial. He also did not believe Ong’s “dishonesty” was proven. He agreed that punishment was warranted, but thought suspension rather than dismissal was in order. Jose Catral Mendoza: No separate opinion written. Cited agreement with Justices Perez and Reyes. Jose Portugal Perez: Generally the same argument as Reyes, but in different words. Lucas P. Bersamin: Same basic argument as Reyes. He did believe Ong was dishonest, but thought it was not a serious incident and did not warrant dismissal. Presbitero J. Velasco, Jr.: No separate opinion written. Cited agreement with Justices Perez and Reyes. The Code of Judicial Conduct requires “[j]udges [to] ensure that not only is their conduct above reproach, but that it is perceived to be so in the review of a reasonable observer.’ A judge should ensure that his conduct, even out of court, maintains and enhances the confidence of the public in the impartiality of the judiciary. The expectations of propriety are higher for Sandiganbayan justices like Justice Ong. It is the Sandiganbayan that has the primary exclusive jurisdiction to hear and decide the most difficult cases involving graft and corruption. Did the Court play politics in the Ong ruling? No, not really. Judges appointed by Presidents Arroyo and Aquino went both directions. The Ong case was more a case of judicial reasoning and a display of the weight various court justices place on bad behavior. One can certainly take the legalistic road as Reyes did on his dissent, citing that laws don’t allow hearsay evidence to be given any consideration. Or one can take the contextual road that Leonen did in his argument, that everything put together draws a horrible picture, and Ong’s dishonesty underpins everything because it reflects his character. That dishonesty is inexcusable. A person of this character CANNOT be a judge. That difference in approach – legalistic or contextual – also gets right to the heart of the DAP ruling. Does one go by legalisms or by context? And how much weight does one assign to the values that form the bed, the rationale, for the acts? They can be either positive values (good faith for DAP) or negative values (dishonesty for Ong). Bottom line, how much weight does one assign to integrity? I think citizens have to be concerned when the top justices of the land . . . five of them . . . don’t assign much weight to dishonesty by a judge. I’m starting to get to know the justices now. Leonen, the youngster, bright, principled, and independent. Carpio, wise, experienced and legalistically capable. In the research for this article, I particularly appreciated learning a little more about Justice Jose Mendoza who was appointed by President Arroyo in 2010, as she was stacking the Court with allies. He described President Aquino’s Executive Order establishing a Truth Commission, disallowed by the Court, as a “vehicle for vindictiveness and selective retribution.” That harsh readout is reflective of the strange goings-on in the latter part of the Arroyo years, when President Arroyo was stocking the court with her friends, and the early part of the Aquino term, which Justice Mendoza must have viewed with alarm. The judges I am most wary of are those appointed by President Arroyo in 2009 and 2010 because I don’t trust their allegiance to the law and the nation over personal allegiances: Justices Villirama, Del Castillo, Mendoza, Perez and Bersamin. Therefore I am not surprised that three of them dissented on Ong. They seem . . . um . . . “fluid” on integrity. Justice Mendoza also wrote the RH Law opinion which contained the following admonition: ” . . .the church cannot impose its beliefs and convictions on the State and the rest of the citizenry. It cannot demand that the nation follow its beliefs, even if it sincerely believes that they are good for the country.” So he clearly can take a “big picture” view of the law. When he wants to. When you assume that the judges are no idiots and that they know the price of a car, a house, a trip abroad, then you know that they see lifestyles in the judiciary that are not explainable with ordinary salaries but they keep silent. When you see the cost of an annulment and the scams set up around them to drive up these cost (and annulments are not the biggest cases judges deal with), then you know that billions disappear in judges’ pockets. (At 200.000 peso for an annulment and 10,000 of annulments a year you know that 2.000,000,000 peso is going to the judges, prosecutors, clerks and lawyers for annulments alone). The question is not integrity or not, but the degree of dishonesty. Politics, being legalistic or contextual, all just a smoke screen to hide the billions of extra income. What you read and hear is just a cover-up, to give the judiciary an air of solemnity. This is country where the elite thrives on association and rent. I was so focused on the Supreme Court that I had not thought about how corrupt the judicial system is, and how loudly money speaks in the determining of justice. Your annulment example is perfect. An entire industry built on favor-payments. And an uncle of my wife was able to buy his way out of jail with a P50,000 payment to the judge. One would think that if the Judiciary is truly interested in being independent, it would welcome the engagement of DOJ and other investigative units to clean up its broad, wide ranks of corruption, because it will never be independent as long as it is owned by dishonesty. When the judges and court employees cry “independence”, it means hands off so we can continue to enrich ourselves without interference. It has nothing to do with justice. I cannot trust anyone in the Philippines. Philippine journalists cannot know who owns Binay Hacienda. Philippine Register of Deads cannot establish ownership of Binay Hacienda. The Philippine Government cannot know for a fact it belongs to Binays. BINAY CATEGORICALLY AND FACTUALLY STATED BEFORE PHILIPPINE JOURNALISTS THAT THEY DO NOT OWN THE HACIENDA AND THAT INCLUDES ATE NANCY. Just the same Binay is already found Guilty!!! With the perception that the “owners” of Hacienda Binay are frontmen. So, in essence, the Filipinos, Philippine Journalists and the JUSTICE SYSTEM are inisinuating that Binay can SUE the “frontmen owners” to give back the Hacienda to the Binays. And who decides on this? IT IS THE COURT! If it is true that Binay used frontmen, Binay cannot SUE THEM TO HAND IT OVER TO THEM. THE FRONTMEN CAN CLAIM IT AS THEIRS. Even if Binay have to kill them, legally, they still cannot have the Hacienda. Why Filipinos are thinking this way? Because THEY DO NOT HAVE TRUST IN THE JUSTICE SYSTEM AND THAT INCLUDES THE SUPREME COURT. MARAMI PANG BIGAS KAKAkainin ang mga Penoys. Since nobody cannot know and claim to own the Hacienda, I WILL PACK UP RETURN TO THE PHILIPPINES AND CLAIM THE HACIENDA AS MINE JUST LIKE SPRATLEYS. I hope you have the budget. Eventually the one who pays the SC the most will get the tittle and you’ll have to pay a lawyer too to choreograph all the steps leading to the SC. Your estate is growing by leaps and bounds. Keep up the good work. I apologize for the CAPITAL LETTERS. I am just so maaad after reading about BinayLand in the papers. It seem nobody absolutely cares about evidences and justice anymore. It is more about perceptions. Perceptions can send a Filipino to prison. But lo and behold, perceptions in the Philippines are found out to be true in the long run. The precedence as already been written in stone. And that includes Chief of Justice subpoena photo negatives of PDAF Scam Queen’s daughters wedding because anyone in the wedding picture are all guilty that includes the ring bearers and flower girls. They are doing better. The anti-money laundering council is on these cases, and last night it was reported that they had identified some P87 million in deposits going in and out of Senator Revilla’s accounts at the time Whistling Benhur Luy said payments were made. I think they will be all over the Binays, too. Following the money. Connecting it to the SALNs . . . or not . . . The Brilliant Penoys cannot know what is illegal and what is acceptable in court of law. That is a fact. That is why when anyone buy a real estate property in the Philippines I have to sign two Dead of Sale: One, the real selling price, two, Deed of Sale for BIR purposes. Why would they do this? Can’t they know that two Deed of Sale showing different selling prices acceptable in court? Filipinos cannot know this. They refuse to know this. They deny to know this, or, they are just plain ignorant. Because the Supreme Court down to Department of Justice cannot know and educate the filipinos that it is illegal and not acceptable in court. That is why to this day, Filipinos are just Affidavits away from prison, that is Affidavit of Hallucinations. Justice in the Philippines is a Hallucination. Yes, that double deed business indicates how deep the matter of favors and cheating go. I’ve bought two properties and in both instances an attorney recommended the two deeds, one low price, one real price. The former, of course, was for the taxing agencies. So the attorney recommends being a criminal, and of course, I became one. “It’s the way we do things here, Joe”. Well, actually, my wife became the criminal because I can’t own squat here. Selling my last home in the US was about as easy and painless as trotting down to Macys to buy a new pair of trousers. The notary and real estate agent did all the documents on a computerized basis, I trotted in and signed and initialed about 20 pages of this or that. Done deal. I spent about 45 minutes on it in two different meetings with the RE agent and notary. The notary was not a lawyer, but a real estate specialist. Here are whys the Penoys do not “trust” the Philippine Justice. No, the word is not “trust” the word should be “not believe in justice”. Because … of the media. The Philippine Media. The Philippine Media cries wolf all the time. The the Filipinos believe in the wolf. When Wolf is nowhere to be found, the next cry of wolf they believe no more just like Philippine Justice. So, my political axiom still rings true to this day, “What goot is a goot president if 99.90 of the Filipinos are not goot”. 1. Create a Law that will tell only TRUE news, those who will do irresponsible news shall be asked to pay the equivalent penalty. 3. Remove Red Tapes from all sort of Processing to quicken the economy. 4. Increase Health awareness for all people, especially the military those with big belly shall be ordered to re-shape, otherwise no salary increase. 5. Those who will steal in any form such as false expense report shall be asked to pay double of what has been priced. 6. Those who will drink and drive shall be asked to pay the penalty of his one month salary payable in 6 months or more depending on approval. In short sentences, the procedure is not goot, hence the people are not goot he he he, PNOY is currently trying his best and started removing the corrupt, time is not enough but hopefully the next President will be able to picture out what is the fastest way to make all people goot. I think the Philippines could take a page from Lee Kuan Yew’s book. His governmental policies regarding corruption, international image, corporal punishment and the economy could work well in the Philippines. No one could argue that Singapore is a successful nation and Lee rightfully earned being called the Father of Modern Singapore. What is happening with the Supreme court FALSE decision above? Janet Napoles did the greatest swindling of the Peoples money, anything, anyone or whatever witness to Pin down Napoles is a must, how can Supreme Court Dismiss that??? And how come the good intentions of DAP are not seen??? As explained below??? •	Article I, Section 4. The prime duty of the Government is to serve and protect the people. . . .
What kind of thinking are these justices, they should be for People of the Philippine not by their interpretation of the LAW. Don’t they REMEMBER, the Law were Created for the People of the Philippine. I pray to God Almighty to align the Brains of these Justices for the goodness of the People of the Philippine and the whole Country itself, it is not too late yet. They are just Human Being, they can make mistake and they should accept that if they are willing to serve JUSTICE. They can read the big picture when they want to. Or the little picture. Depending on what they want to accomplish. THAT is the politics of the judiciary. Their anchor is not justice, it is what they want to accomplish. Simple logic for the justices who saw wrongdoing but was NOT sufficient to warrant dismissal or forfeiture of benefits – they may want to establish a precedence which thay or their associates can use in case they find themselves in a similar situation. Otherwise, why would they look at Ben HUr’s testimony as hearsay when now, the AMLC has confirmed that the timelines of Ben Hur’s ledger on Revilla mirros that of AMLC’s records on Revilla’s deposits. (Inquirer 10/10/2014: Revilla P87M deposits found. AMLC: Fund movements jibe with Luy’s records). Justice in the Philippines is for the highest bidder – otherwise, how could one explain the numerous flipflops the SC has made on the PALEA cases? And on this PDAF issue, perhaps one man manipulated all this to pave his way to say later on : PILIPINAS, ATIN ITO. (to mirror the Makati logo : MAKATI, ATIN ITO). That’s a superb point. The AMLC’s finding raises the credibility of Luy to 100%, so if the SC on Ong simply put no stock in the witness credibility (that same Luy), and went by the hearsay ruling to strike his testimony as irrelevant, they would let a scoundrel judge off free. A precedent case for any cases brought against them for dishonesty . . . as you say. We should cheer mightily Justice Leonen. His opinion was exactly on point. While I really don’t like the way you belittle the call’s for “judicial independence”, as clearly it was Aquino who started it when he made that “horrendous” speech last July 14. I am willing to agree with you that yes there is politicking in the supreme court and you are correct in pointing that it can be seen in “fluid” integrities, depending on the issue. — This is a separate debate, but it seems that all of the Justices here voted legalistically. The issue was never on good faith. It was whether or not there can be cross-border transfers of funds. The “good faith” pronouncement was probably just a misplaced obiter dictum, and unfortunate at that because it caused all of this divisiveness. You claim that the independence of the Judiciary was undermined by Corona and the “packing” of justices. So given this “undermined independence”, The court must regain its credibility–go back to the days in the 50s when Filipinos could really count on the Supreme Court–when people knew that even if something anomalous happened in the lower courts and there was injustice, they knew that wrong would be corrected in the SC, no matter how long it took. The SC had a good rep back then, and the justices were scholars-statesmen. And in my (kaleidoscopic view) of the SC, was trying to do that in the DAP and PDAF cases–trying to regain credibility. 2. I don’t think that you can compare Mendoza’s pronouncement in dismissal case of Gregory Ong to his pronouncement in the RH Bill. A dismissal case of a judge is different from a constitutional challenge. In a dismissal case, the integrity or the perception of a judge’s integrity is of paramount importance because judge ethics provides that judges must avoid even the “semblance of impropriety”, this implies that even good faith is not a defense for what Ong did. In constitutional law, one has to necessarily take the big picture. In saying number 2 however, I will agree with you that the dissenters of in re Gregory Ong got it wrong. The case should not have been decided on technicalities like lack of evidence. Mere semblance of impropriety will do and a only an onus less than beyond reasonable doubt. But since the majority voted for the dismissal of the erring justice, the SC has regained some credibility for that. Very good parsing of my argument, and the discovery of its weaknesses. As for who “started it” (the tussle between Executive and the Court), although I can agree with you that Mr. Aquino’s speech made a bad situation worse, the Court’s ruling was exactly of the same caliber as the President’s speech, insensitive to the mandates and ACCOUNTABILITY held by Executive. The Court does not share that accountability, and I’m guessing any of the justices would be hard pressed to say they would have done anything different than the Aquino administration if put in the same predicament. That is, they would put the nation first and foremost over fine legal readings. That Court ruling came before the President’s speech. I concede to your view on points 1 and 2. Nicely stated. I agree with you that there should be greater accountability. There should be point where the court does something about the common or greater good but at the same time, it does not pander to the mob or just rules because it is popular. I cannot give a specific suggestion right now, aside from what I argued previously (removing the requirement that the SC has to “decide” every case). But I think that there is a dissonance in the way the justices decide constitutional law problems because of the difference in they way the justices treat “personal law” problems and “public law” problems. Unlike the US, the Philippines is not a “common law” country when it comes to crimes and personal laws, but It is largely common or “judge made” law when it comes to public law (a situation that is analogous to Louisiana and Puerto Rico). That means that at least as far as the relationships between persons in society are concerned, what governs is the statute books and the Judge only rules according to its interpretation. This would make elections for judges downright dangerous (just in case you would argue that in the future 😉 ), but at the same time, this “legalism” in personal law matters influences “common law” government. There are brilliant constitutionalists and there are brilliant civilists, but to be an SC justice, you have to be both and must have integrity at that. Powerful close. I don’t like elections for judges myself. They were always on the ballot in California and I had no idea who I was voting for. Putting them on the ballot makes them political, and they ought not be political. Very good waxing, sonny. Politics is the energy of democracy, eh? A massive conglomeration of checks and balances. Ah, excellent readings. Indeed, it is the currents between objects, and not the objects themselves, that warrants deep study. It is one of the themes I struggle to get across to the audience here, the DRIVE, the ENERGY, that exists in an honest capitalistic, humanistic enterprise where opportunities for self-enhancement are set out to get people to WANT to be productive. If I cite the importance of fair employment laws that ban the hiring (in large corporations) on any basis but qualification and competence, it’s like no one gets it . . . the energy of opportunity. The US thrives on that energy. Here is is suppressed by autocratic mandates. Political checks and balances and free speech are chaotic means to maintain order. ahahaha I think that is what is meant by “counterintuitive”. Philippine case law, on the other hand, is chaos that promotes chaos. The quality of a judgments is one thing, but acceptance of a ruling is even more important. The SC has to fire first 500 more Ong’s at least and in unanimity to reestablish the credibility of the judiciary. In the meantime all the rest is highbrow talk that might improve the “academic” quality but it will have no impact at all on society. So I think it’s better if I paraphrase it in a more incisive meaning to drive home the point: no integrity, NADA, totally immoral and unethical non-adherence to principles. Humans prone to commit mistakes? I’d say they are inhuman(s). Ah, very good, the choice is black and white, and there is no grey on integrity. That is exactly Justice Leonen’s point. Thanks for putting that in proper terms. Joe, can we find a way to make the Supreme Court read this? Ahh, I only write them and don’t try too hard to be an advocate. Maybe an reader who is an advocate will push it over. I suggest you forward this to Oscar Franklin Tan, Rene Saguisag, and Dean Mel Sta Maria who are all critical of the SC’s decisions from time to time and have the gravitas to do so. 🙂 Naked as a jaybird. The reading of Joe America’s posting by the Supreme Court is not enough. Talk is cheap. Something must be done to correct and eliminate this culture of greed and dishonesty not just in the judiciary but also in the executive and legislative branches of government. We, the Jury System advocates, have been talking about corruption in government and how a Jury System can minimise if not eliminate it for years now. Since talk is cheap, we started gathering signatures for a NATIONAL JURY LAW petition as a People’s Initiative to push it over. We need a Grand Jury and a Trial by Jury to make our leaders accountable for their actions. But this could only be done if ordinary people are educated about the Jury System and are empowered to administer true justice. The Jury System is not perfect. Nothing is! However, it is better than the Solo-Judge System and the Supreme Court that we have now. If Joe America and the other patriotic and nationalistic bloggers here are sincere in their desire to change the course of our country’s history for the better, they should not confine themselves to just blogging and complaining. I suggest you support our campaign for the adoption of the Jury System. We urgently need your moral and financial support. Please read more about us_ Worldwide Philippine Jury Initiative at http://www.philippinejury.com. I think in all societies, different people have different roles. Mine is to study Philippine culture, learn, opine, learn, opine, learn and if in the practice of that, I teach . . . great. If you choose to be a doer, I think you ought not choose to diminish those who choose different roles, as long as they are constructive, or even benign. Or what is freedom for. If you construe the article as complaining, then I suggest you read it again, until you grasp that it is my struggle to understand, and to offer ideas that provoke, for whatever value they may have. As for giving money, get in line. There are plenty of good causes lined up at my doorstep and advocating a jury process is way back there. You would have to convince me that the process can be administered correctly. For each seated jury, some 50 or more people have to be subpoenaed, and qualified, and instructed. Most “peers” here don’t even have addresses or a post office that can deliver subpoenas. And let me assure you, a way to get a donation from me is not to get on my blog and suggest the people here are complaining. They are problem solving, in as mature a fashion as you will find in the Philippines. So I will read your internet site when you summon up respect for mine. I did not mean to reply to your blog nor ask for donations. I happen to see your blog about the Supreme Court in a MoonglowPlanet email, which caught my interest. As I read on and on, it ended with the comments. What else could I do but comment? What should I say? Should I just say, “Yes, I agree”? I really thought your blog was well researched and remarkable. But then, how was I to contribute to the discussion when you have said everything? Besides, you have indirectly invited other advocates to join in when you said, “Ahh, I only write them and don’t try too hard to be an advocate. Maybe an reader who is an advocate will push it over.” A very inviting invitation, I must say! So, I jumped at the opportunity to tell you and your readers that there already advocates pushing the issue over. Can you blame me? Of course I understand that some people just ‘talk the talk’ but not ‘walk the talk’. This is where we differ. Anyway, since you said that jury service is one of the most rewarding experiences you had in US, why not give the Filipinos the opportunity to serve his country as a juror? They might surprise us! Why not write something about your experience as a juror? That way, your talking the talk can help those who are walking the talk. We will be very grateful. We don’t differ. A good number of people who contribute here do indeed walk the talk with their activities and advocacies. Some work within government in substantial positions. Can’t walk much better than that. I choose a different way to contribute because it suits my time, place and inclination, the latter being an enjoyment and decent talent at writing. I think the likelihood of there being a jury system in the Philippines is remote, and I’m not convinced my experiences as a juror would be relevant to many people. If they are relevant to other topics, as allegory or somesuch, I’ll introduce them. Of course we differ in that I just don’t talk, I also walk. You just prefer to talk and talk. No offence meant. You are entitled to your opinion and preferences. I was just suggesting that if you really mean what you say, do something about it! Donating is one! Writing your rewarding experience about your jury service is another. You will encourage Filipinos, who are reluctant about the Jury System due to fear of doing jury service. Do not underestimate the Filipinos. Despite all the hardships brought about by corruption, the country has produced Doctors, Nurses, Teachers, Engineers and many more, who are sought after in developed countries. Given the right environment check and balances in government, we will do even better. We can be the next tiger of Asia if we can improve governance as acknowledged by people in the know. We can achieve our dream like you in America by installing what was omitted from our constitution that was patterned after the American Constitution _ the JURY SYSTEM. There is a time for everything like the seasons. Further, good idea or invention will stand the test of time. The Jury System has existed for hundreds of years in UK and US. Even Japan and South Korea has recently adopted it. Jury System in our judiciary will come and sooner that you think! I get thanked by Filipinos far and wide for my contributions here, some of them notables. But because I don’t walk YOUR specific talk, I am somehow falling short. My job here . . . and it is work, actually, to devise a good blog . . . is not to peddle your wares or pay for your project, the jury system. I’d ask that you refrain from visiting and commenting on this blog site unless you are willing to discuss a pertinent issue raised in a blog. You have just moved into the category of “spam” with your denigration of my efforts and peddling of your pet project. A Jury System with a Grand Jury and Trial Jury is one way. It will empower people like Joe America to actually administer true justice not just to judges, justices, presidents, senators, congressmen (in other words to all our leaders political or not) but to all who have committed serious civil and criminal offences. People like Joe America and the other patriotic and nationalistic Filipinos should not be confined to their desks with their pens. As Grand or Trial Jurors, they could actually do something tangible for our country. I’m not a citizen. If you want me on a jury, I’d be delighted to serve. It is one of the most rewarding experiences I had when in the US, to really participate in civil deeds. But see my response to your other note . . . If there is a culture of impunity, it is because of the justice sytem. This country will never be fixed if we don’t take the “For rent, lease, or sale” sign in front of our courthouses, prosecutors offices, and police stations. Wealth inequality would less painful if there is an equal and impartial justice system because wealth will not be a tool to exploit and oppress the poor. A society cannot claim that it is capitalist – equal and open competition etc – if its justice sytem is marketable. By the way, AJ Brion’s concurring opinion is a good read. He introduced something new; he gave a very good argument for revisiting the hearsay rule in certain cases specially those involving bribery. I was a bit surprised by Brion’s opinion because I remember him as the Arroyo appointee who voted to uphold the infamous gag order issued by Arroyo during the ZTE-NBN hearings despite the fact that when he joined the Court and voted all the oral arguments and debates on the case were already done. In a way, he voted sight unseen. Anyway the man’s concurring opinion is a good read. Thanks, MB. I was favorably surprised on his vote, too, and will read his opinion. 1. I have opined before that there are two kinds of justices in the Supreme Court: the Regressives and the Progressives. 1.1. The nine Regressives are the GMA appointees, with the exception of Carpio who I consider to be a Progressive. 1.2. The four Progressives are the Pnoy appointees, with the exception of Reyes who I consider to be a Regressive. 2. In Ong, the dividing line has been crossed. 2.1. Brion, Del Castillo and Villarama – all GMA appointees – joined the Progressives in dismissing Ong. 2.2. Reyes, the sole Pnoy appointee to do so, joined the Regressives in voting for the mere suspension of Ong. 3. The voting of the justices is also instructive in the two other cases about protecting members of the Judiciary – the Midnight Appointment of Corona and the plagiarism case against Del Castillo. 3.1. Three of the pro-suspension justices, namely, Mendoza, Perez and Bersamin, closed ranks with their colleagues in both of these cases. 3.2. While both Velasco and Reyes sided with the majority on the plagiarism case, the former dissented on the Midnight Appointment case. 3.3. Reyes, not yet a justice at the time, sponsored a Mass in support of Corona, thus showing his Regressive streak. 3.4. Needless to say, the Regressives who temporarily joined the Progressives in the Ong case – Brion, Villarama and Del Castillo – all voted in favour of the Midnight Appointment. The first two also voted to protect the latter in the plagiarism case. 4. In the recent Jardeleza affair, seven of the Regressives elected to include Jardeleza in the JBC shortlist. 4.1. Two of the Progressives inhibited of necessity: Sereno and Carpio. 4.3. 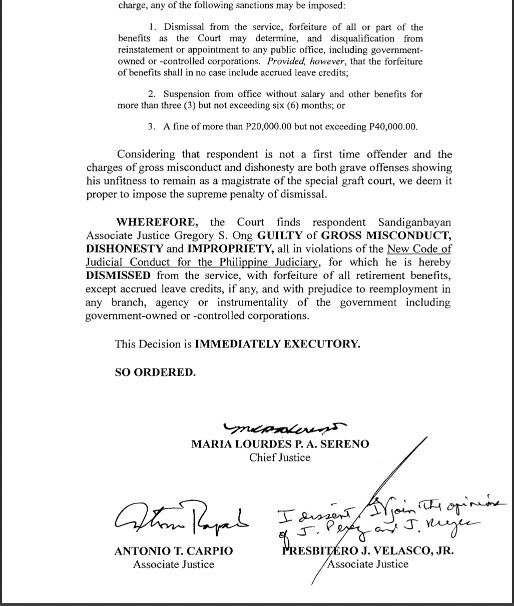 This case is startling in that the Pnoy appointees voted against the President’s wishes. A true proof of independence alongside the DAP decision. 6.1. The dividing line between the Progressives and Regressives remain largely unbroken, with one or two crossing the line in each major case. 6.2. The DAP case may be the only major decision in which unanimity was shown. 6.3. As noted by JoeAm, Leonen in both his concurring and dissenting opinions seems to be a bright star in the firmament of the high court. He seems to be the only who has demonstrated sensitivity to the issue of judicial overreach. 6.3.1. Leonen has voiced his suspicions on the other two Sandiganbayan judges who worked with Ong in acquitting Napoles in the Kevlar helmet case. 7. I would like to remark on one of Ong’s strange propensities: his desire to don the robes of the Black Nazarene. 7.1. This propensity strikes me as one aspect of the dark side of the Filipino character. Here you have a high functioning individual, a judge operating in a highly rational manner in his professional life, but beset with a non-rational superstitious yearning in his private life to beg for a miracle or to assuage the guilt of wrongdoing. This is indicative of the split in the Filipino psyche as shown by our corrupt officials, one side showing an honourable facade of public service and religious devotion, and the other side a horrible grasping monster of lust and greed. 7.2. This is the Filipino and Catholic way of trading favors with God. This is Napoles consorting with priests left and right. This is Enrile having bishops officiate holy mass in a private chapel. This is Revilla going on a Holy Land pilgrimage. Very interesting classification of the justices. Your “regressive” tag could probably be replaced with a “political” tag. That is, they are regressive because they are not judicious, an appropriate word when speaking of judges, eh? They are political or childish, the latter a reference to petulant refusal of Carpio and others to show up for the flag ceremony after Sereno’s appointment, or Sereno’s aggressive personal move to keep Jardezela off the court. Then there is Reyes, ending up to be firmly on the side of Ong and his injudicious – in the extreme – behavior. Then there is Brion, who demonstrates he can think for himself. With integrity. When he wants to. It is that “when he wants to” tag that is important to me. That’s why it is the last line of the blog. These are smart people. It is a choice to let childishness or political favors or personal spite enter their legal renditions, or behaviors in dealing with one another. Or a lack of discipline. If we scored points with each case, we’d see Leonen and Brion piling up points on Ong for “thinking big” (2 points each), those voting in favor of dismissal getting 1 point each, and Reyes and the other “suspension only” judges getting -1. If we did that for each case, it would soon become clear who on the court does not belong there. Brion is literally the Devil’s Advocate. #7 is plainly Edgar’s reductionism of what is Catholic. You can’t even begin to understand what is meant by the word!!!! For you Catholic and bad is one and the same thing!!!! How does one reason with such a twisted mind!!!! 1. You will pardon my equating Catholic with badness. You are one good Catholic. But arrayed against you is a mass – pun intended – of bad Catholics. And I don’t even know that the current pope is Catholic. So when I try to balance the scales, they tip against you. 1.1. Unless…unless… granting that there are 1.2B Catholics worldwide and granting an average weight of 67.7 kg, that would be about 81.24B kg in total. You do not weigh 81.25B kg by chance, do you? 2. Thank you for the compliment. 2.1. To reason with a twisted mind you need one. 3. I noticed you did not gainsay the observation on the Catholic propensity – Ong’s in particular – for devotional fetishism. You are not looking hard enough. Since you are not even considering the Pope, I am not too optimistic that you are looking at all. I do not sense a compliment directed at you nor me. I’m still under the umbra of your vexation for Catholics. If I am no challenge at all then that is your prerogative. Truth should reside in complexity and straightness, I feel. Not one or the other; unless we don’t share the same aim. Catholics do have a propensity for what you call ‘devotional fetishism.’ I understand you partially as I understand devotions and fetishes. What do you mean by the compound term? I also do not understand fully which behavior of Ms Ong’s you are calling her ‘devotional fetishism’ because I cannot search her heart and her mind. I don’t know her personally nor her religiosity. If you are trying to vet her and her Catholicism and say either one or both are fetishist, then I need to understand you also. I am trying to avoid strawmen arguments and obfuscation. If I may join this exchange, this is what happens (and what Edgar points out) when the “proprietors” of Catholic doctrine do not exercise effective control of its doctrines, enabling its followers to misunderstand, mis-apply, twist, adjust, mangle or disobey it and still call themselves followers. If the RCC had a core group that it can point to that adheres correctly, then we may get somewhere. But alas, the RCC does nothing. Andrew, I don’t know what else to say. If I am not coming across and you still say that what I have is a non-answer, then I probably am not the right messenger for you to hear. Product: “DO THE RIGHT THING” (Primarily the Ten Commandments). I think we agree on this statement. “Why not exert better control over the followers to make sure they understand and apply it to their lives? Is this one of control or persuasion? I understand individual knowledge & free will are conditions God requires for rendering love and obedience. The teaching Church are only His agents to proclaim and promulgate his Gospel. The doctrines and commandments are normative by themselves. From communication to action is a process of mediation between teachers and members done in place and time over the lifetimes and geographies of each member: doctrine (teaching) to action (terminus of understanding). This logistic was what I was pointing out with that statistic of 1 priest to 40,000 souls in a living community partaking of the graces of the sacraments. The priest with the assistance of delegated lay people populate the life of the community. Nothing less will work. This statement denies the daily action of priests, bishops, lay ministers who labor and support the life of obedience to the commandments. Try to get an idea how this is happening by watching the spiritual lives of the Catholic communities, not where it is not existing, i.e. in the lives of people who choose lives of violence, unchastity, corruption, robbery, cheating. Instead of raising your anger at bad priests, bad Catholics, seek to help the good ones who are burdened and suffering for the sake of God’s kingdom. These people are within arm’s length. And God does not have a police force in the bedroom and the marketplace except the consciences of good men and women. 1. I have looked hard – long and hard. Have you? Do you think I make charges lightly? Of the several transgressions of the Church, let me just point out one: how do you justify her institutional cover-up of sexual clerical abuse? Is that not evil covering up evil? Has the Church obtained divine mercy by confessing, in kind and in number, all the sexual clerical abuses in the last, say, 100 years? Have you experienced the tears and agony of one victim of sexual clerical abuse? Do you know that the Church is spending billions in compensation for these victims? 1.1. If the Pope is a “true” Catholic he would not be seeking to conduct surveys and attempting to modify doctrines. Not a true Catholic, but perhaps a true Christian, which is more important. 2. I took it as a compliment because it is an attestation of an ability to see beyond commonly held perceptions. Did you mean it as an insult? Sorry, I am not easily insulted. 2.1. What is truth? Is your aim to discover a mutually acceptable truth? Or is it to defend/spread your truth? If it is to discover, then we have a common aim. 3. Ong is a ‘he’. I do not know him personally. Read the decisions of the justices in the post. And search your mind and heart. 3.1. Apparently you have not read my comment at item 7? 3.2. Fetishism is belief that an object has magical/supernatural powers. 3.3. Devotional relates to worship. 3.4. Combine the two: worshiping/adoring/venerating an object (or entity) believed to have magical/supernatural powers. 3.5. I am saying that Ong and Catholics practice devotional fetishism. “Catholic” and “Apostolic”, (see the Congregation for the Doctrine of the Faith and the Pope in his Wednesday, Sept 17, 2014, homily in Saint Peter), “Catholic” meaning only one model should exist, one truth and it is “apostolic”, requiring to convince everybody of this single truth. When I see the Catholic models shift over time, when I see the huge variation in interpretations between individuals, it is impossible for me to see what is “Catholic”, what should be universal. Only the “religious” truth, the Nicene Creed – and what version/interpretation? Or the whole deduction of 20 centuries of catholic theology, liturgy, ethical and moral guidelines, including its “scientific” interpretations…? And what reading, is only the Congregation for the Doctrine of the Faith interpretation infallible? Whatever Sonny’s interpretation, I accept it has his choice of truth, even if not everyone calling himself Catholic believes in exactly the same truth or does not live according the same guidelines. Edgar’s models seem to be different but equally acceptable. Today the question is not what are the best models but more pragmatic, in this case what to expect from a SC judge to help the majority of the Philippines more in realizing their dreams. 1.1. Totally agree. This is the essence of pluralism. – Models cover different kinds of categories: culture, religion, physics, etc. – Models that do not account for or embrace pluralism are limited models. They may be working models to a degree, but are not “universal” models. Examples: all exclusive religious systems and Newton’s classical physics. – Limited models demonstrate particular aspects of truth. Example: Classical physics allows the accurate calculation of planetary movements but cannot be used in quantum mechanics. – Limited models exhibit a general internal coherency (or rationality). – Limited models contain random inconsistencies (or irrationality and uncertainty), which are symptomatic of their non-universality. – Limited models may be based on singular universal truths. 1.3. It is the last implication that bothers me. 1.3.1. This is an assumption that I make. But it is not only elusive. It may be illusive as well. 1.3.2. This assumption is basically for the existence of a “meta” model under which all models of a certain category can be subsumed. A general theory of everything (ToE). 1.3.3. More than that, the meta model will be able to identify and establish the singular universal truths common to all ordinary models. 2. RCC is Catholic and Apostolic. 2.1. Again, totally agree: RCC is not catholic nor should it be apostolic. 3. Whatever Sonny’s interpretation is… it is his choice of truth. 3.2. The spirited debate among us – Sonny, Andrew and me – revolves around Sonny’s non-acceptance of the criticisms that we weigh against Catholicism. 3.3. Sonny is right to protest against our “biases” from his internal view of his model. 3.4. But, at the same time, we see our “biases” as legitimate insights into his model from the outside. 3.5. Important: I note that Andrew is a Catholic, so he has this unique ability to view the Catholic model from the inside as well as the outside. 4.1. Agree, but the scope and influence of religion tends to stray into the secular domain. It should not be the case and it is unfortunate, but it is the reality. The impact – Andrew would say “and non-impact” – of sectarian belief over the behavior of ordinary citizens and public officials is enormous. So it becomes germane to the discussion. It is the elephant in the room. And the reality is that the Church, in its waning influence, insists that the impact must continue to occur, and this the secularists and all good Catholics must resist. I’ve just read and re-read the replies above. Thanks for them. I can see me and those concerned in a truly better light. My “hot” reaction is directed to statements made in what I sense are globals (universals) and misdirected particulars, implied contexts that can or cannot be transparent to me, specifically the use of “a,” “the,” and the loud absence of “some,” the very free use of parts for the whole and vice-versa, etc. In my opinion, since the interlocutions here are diverse, localized and still heterogenuous, these adjectives are very important. I have presented my points without infidelity to the truths as I understand them (I don’t believe in the relativity of truth). Neither have I tried to persuade anybody to my “biases” because I am aware that much of what somebody says are perceived so. The global overview of models and meta-models does make things clear, and I appreciate you were able to absorb the big picture. Your particular model does not accept the relativity of truth, which is exclusivism. But Francis, in his rapprochement with Jews and Muslims, does value pluralism. I am not sure though that his pluralism embraces inclusivism. Multicultural is where we find ourselves with others. Intercultural are the interactions we do among others. Truth is one and intersects everything. (my understanding). What is scary is the next president will be able to appoint majority of the SC Justices. Therefore, 2016 election is very crucial to the people of the Philippines. Heidi Mendoza for 2016! It is amazing how similar in age the justices are. That will come home to roost in one swarm of appointments. Scary is right. You’d have to make a case for Ms. Mendoza. She is obviously of strong character, but I’m not sure COA is functioning as well as it might. Yes. I watched the hearing where some of COA’s practices were exposed to be outdated and obtuse. COA is another government agency that needs revamping but I am glad that it is now out in the open and hopefully, something will be done about it. She can move to DOJ when de Lima becomes VP. I agree, Justice Leonen is a worthy member of the Court. At the height of the PDAF scandal, I attended an SC hearing, wanting to get a broader understanding of the issue, as I was not really in favor of abolition. The hysterical anti-PDAF reactions of the loudest sectors weren’t contributing much sense to the debate. I wasn’t sure abolishing the PDAF was the solution to the appalling corruption, as the same amount of money would still be available anyway, but simply transferred to the implementing agencies. New characters might then plunder those funds. Justice Leonen put his point simply (I cannot recall his exact words now): If there’s a hemorrhage, the blood flow should be stopped. Indeed. So, when the PDAF decision was handed down, I was convinced it was the correct ruling. Because of Justice Leonen’s clear, no-nonsense logic. On the DAP ruling, he also disagreed with the guilty-until-proven-innocent concept, pointing out that one cannot say a program is beneficial, then assign bad faith to its implementors. I could not agree, though, with his stand on Jardeleza’s inclusion in the JBC shortlist. He said it was judicial overreach for the SC to have even deliberated on the JBC ruling disqualifying Jardeleza. But it didn’t quite address the root of the matter, the nominee’s basic objection: that the JBC had essentially interpreted their rules in a way that gave veto power to a member of a collegial body. Very interesting background, Dolly. One of these days I’ll rank order the justices by criteria such as intelligence, integrity, profound reasoning and other criteria yet to be concocted. I’d guess that Leonen would be near the top. Just to add a bit to my post above… The first time I heard about PDAF, many years ago, it was positive for me. A good senator had donated P40 million to Gawad Kalinga (GK) without the 10-20% “SOP.” I felt inspired to get involved with GK, too, in my own, small way. But I soon learned from this senator that he had not been receiving his PDAF since he joined the opposition. I was stunned. In my naïveté, I felt so offended at the idea that PDAF beneficiaries should suffer because politicians were playing politics. I was acquainted then with an Arroyo spokesman (good person, now deceased), and I asked him why this was being done. He chose to be amused by my naïve question, and simply replied that it was like giving ammunition to your enemies so they could shoot you. That’s why, in my view, PDAF isn’t evil. In fact, in the hands of a politician with integrity, the people benefit greatly, especially the not-so-affluent constituencies in remote regions. However, as revealed by a CoA report, unscrupulous politicians found a way around the safeguards, and were milking the treasury in a scandalous manner. As Justice Leonen said, there was a hemorrhage. And, as in emergency rooms, one must first stop the bleeding, before addressing any complications that might arise. You are officially now “Doc Dolly”, for indeed that is what is necessary. Stop the bleeding. I think PDAF is indeed a valuable tool for a legislator if he is honest. It allows him to direct money quickly to high needs. Just as DAP is a valuable program for the President. And would be abused by a crooked President. The problem is not the program, but the person using it. I’d strongly recommend you do this, Joe. And put it up as a running blog which can be seen reguarly here. Sort of a weather report. This will help remove some of the opacity of that branch of govt. I think this deserves a blog article of its own. I dont think it will happen but if it does, I will personally lead the storming of Padre Faura. I will be nihilist once and for all! Re article. That would be a “Netty moment”. I give up. Let me noodle and see if I can reasonably do that, Andrew. The comment on veto power is interesting. My initial reaction to its use is: that’s the rule. There must be some justification for the rule. Consequently, my reaction to the SC override is: They have exercised a veto power over the JBC’s veto power. Presumably, the SC approved of the JBC’s veto power in the first place when they set up the council. So the SC should not break the rule. Or rather, they can break the rule prospectively but not apply it to the case at hand or retrospectively. And certainly, not like that at the 11th hour. Further, the nominee should not be able to question the rules of his selection. He does not have the right. I think Leonen’s instincts, his justice compass, are formidable. So, too, are those of Perlas-Bernabe. All things being equal, I would have agreed with you and disagreed with the SC – and Leonen – on PDAF. But all things are not equal, it must be admitted that the CoA is simply not up to the task of regulating blood flow much less to that of staunching the bleeding. That rule is the bone of contention, isn’t it? From how I understand it, this applies to integrity issues brought up by outsiders. The council’s decision must then be unanimous, to either disqualify the candidate or include him in the shortlist. The vote can go either way. In the case of Jardeleza, the vote cannot go either way. Unless the member objecting abstains, the vote can only go one way (i.e., disqualification). That’s where the difficulty lies, for me. Is that fair? Outsiders who raise integrity issues must submit a sworn affidavit, enabling the nominee to defend himself against slander. Legally, if necessary. That was denied him in this case. I’m neutral on the matter of whether a nominee has the right or not to object. I just find it profoundly bothersome that an issue of fairness — of basic fairness — can be overlooked by no less than justices of the high court. 1. Thanks for pointing out that the bone of contention revolves around the integrity issue being broached by an outsider versus an insider. 2.1. There was no bone of contention prior to Jardeleza. 2.2. The Jardeleza case raised the “possibility” that the rules were defective. 2.3. “Possibility” because the defect is assumed. 2.3.1. The assumption is that an issue of integrity raised by an insider is inherently unfair. 2.3.2.1. It characterizes the insider-raiser as a “prosecutor”. Aren’t JBC members duty-bound to raise the issue of integrity if (a) they are aware of one and (b) if no outsider has? 2.3.2.2. It presumes malice on the part of the insider-raiser. Shouldn’t the presumption be one of good faith? 2.3.2.3. It presumes the insider-raiser will vote against the candidate. This is not necessarily so. The vote can still go either way. BTW, the unanimity requirement does not permit abstention on integrity votes. 2.3.2.4. It contradicts the presumption of probity on the part of JBC members. 3. Jardeleza was given the opportunity to defend himself. 4. SC has supervisory power over the JBC. It does not have the right of veto power over the decisions of the JBC, if the decisions were arrived at under the current rules of the body. 4.1. The SC decision puts in doubt the integrity and probity of Chief Justice. Shouldn’t she be impeached or something? 5. Granted there is a bone of contention, the rules should be changed. I do not think they have been. Given all of the above, I am glad that Jardeleza is a Progressive. P.S. No need to reply to this post – just airing out my thoughts. I hope you don’t mind I’m replying again. I genuinely want to understand Sereno’s actions on this, because it is the issue which has made me (unwillingly) reconsider my very-high regard for her. I’ll be relieved to be proven wrong. 2.3.2.1 Yes, absolutely. They must raise integrity issues, if they’re aware of any. The public trusts that the JBC is protecting their welfare. In my view, this does characterize the insider-raiser as a “prosecutor” but, at this point, does not necessarily mean it’s negative, because of 2.3.2.2. 2.3.2.2 Yes, again. Good faith must be presumed. 2.3.2.3 Ah, this is an argument I haven’t considered before. Interesting. I see your point. Maybe the insider-raiser will be satisfied with the nominee’s explanations? This won’t apply, however, to an instance where the insider-raiser is convinced the nominee is truly unfit. 2.3.2.4 Very powerful point. You’re absolutely right. I must still ask, though: How can it be guaranteed that this is true 100% of the time, for all JBC members past, present, and future? I don’t think it can. 3. Yes, I believe you’re right. Nominee Jardeleza refused, and insisted on following the process that would have been used if an outsider had raised the issue. It later surfaced that it involved a sensitive case, the West Philippine Sea arbitration. That was a sound reason not to publicize the concern, and it was successfully kept confidential up to this point. The question is: Who leaked it, and why? If good faith dictated that the objection be kept confidential during the nomination process, good faith would not have betrayed that confidentiality at this point. The undeniable whispers-in-the-dark intrigues of the leaked article cast doubt on that presumed good faith. The inescapable conclusion is that the leak is an attempt to use public pressure to achieve a desired end. ‘Patriotism’ appears to have been used as a convenient excuse, then, when that failed, the pretense was dropped. Here, too, the integrity of PNoy comes into play powerfully. This is not an emotional argument, but a sober one: Any reasonable person will acknowledge that PNoy will not sabotage our country’s arbitration case vs China. Given this, SolGen Jardeleza’s supposed ‘disloyalty’ (implied: treason?) must be viewed in the light of PNoy’s unwavering trust. 4. I agree. Still, playing the devil’s advocate: What if the decisions were NOT arrived at under the current rules? 4.1. You touch on an important, important, important point, I think. I do not think of her as the bad guy. Quite the opposite. I see her as good-hearted, morally-upright, and — apart from the Jardeleza issue which has given me pause — fair-minded. Not even her DAP decision changes these (but it does raise serious concerns on why PNoy has not been afforded the presumption of good faith). You forgot the casting of chicken entrails. Other than that, great minds – or rather twisted minds – think etc. Re 2.3.2.3. One has to presume probity on the part of the insider-raiser. Therefore, you have to allow the insider-raiser to recuse if he/she feels bias. This requires a change in the unanimity requirement. Re the leak: When I first read the leak, my impression was “poisoned” against Jardeleza and his “disloyalty”. The “unwavering trust” that PNoy has shown in him has somewhat dissipated the poison. PNoy can be too trusting. But it leaves with me the afterthought that there might be a weakness in Jardeleza. He bears watching. I have no opinion on who did the leaks and why. Not the Balay faction; probably the Samar faction. Filipino politics is too Byzantine. Re 4: If decisions were made outside the rules – which is highly improbable because there are watchers and recorders – the SC would still have to honor the decisions. The SC and JBC can and should change the rules if there was abuse, but the changes should take effect prospectively. One never changes the rules mid-stream. Re 4.1. I hope not. Re Sereno: I would choose her over a dozen Brion’s. She was very independent before she assumed the high chair. My sense is that she has had to ingratiate herself to a certain degree with her colleagues to establish a working relationship. May she get her legs – or wings – back. Thanks for sharing your thoughts. Always feels good to consider others’ (objective) point of view. I agree with the hands-in-the-honeypot remark. Those were my thoughts exactly when Jinggoy claimed bribery in the Corona impeachment. Take now a politician who has found a way to systematically funnel government funds into his own pocket, with the help of a Napoles-like operative. He considers project funds as his own from the start, and he does not intend for his constituents to benefit from these at all. Only such a politician may consider project allocations as bribes. That’s why when Jinggoy cried bribery, he revealed himself to be of the second type. It was almost funny that he unwittingly admitted to stealing taxpayers’ money. That last bit, it wasn’t just funny… It was supremely ironic, that in a privilege speech where he vehemently denied stealing taxpayers’ money, he in fact unwittingly admitted to stealing taxpayers’ money.